180 Beacon is located on the NE corner of Beacon and Clarendon, with , 172 Beacon to the east, 182 Beacon to the west, across Clarendon, and 285 Clarendon (201 Beacon) to the south, across Beacon. 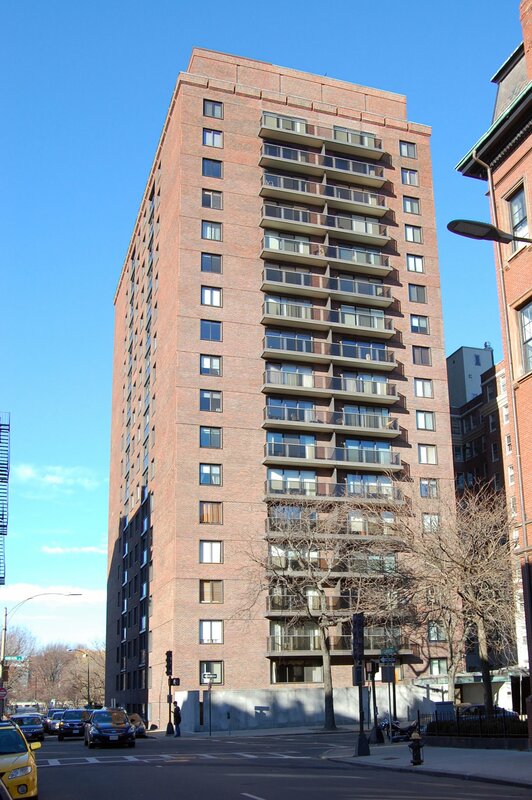 180 Beacon Street was designed by S. J. Kessler and Sons of New York and built in 1964-1965, a seventeen-story plus penthouse apartment house built for real estate developer Max Wasserman. 180 Beacon replaced three townhouses at 176, 178, and 180 Beacon purchased in December of 1959 and January of 1960 by real estate developer Fred Podren. Click here for an index to the deeds for 180 Beacon. On June 22, 1961, Fred Podren filed for permission to replace 176-178-180 Beacon with a sixteen story apartment building with sixty apartments. On November 24, 1961, he transferred the property to 180 Beacon Street, Inc. The permit was approved by the Board of Appeal but subsequently abandoned. On March 12, 1964, the property was acquired by Leonard Properties, Inc., an affiliate of the Wasserman Development Corporation. On March 16, 1964, it applied for permission to construct a seventeen story apartment building with 130 apartments and with an underground garage. As originally submitted. the building was 154 feet, 9 inches high, just within the 155 foot height limit in effect at that time. On May 6, 1964, Max Wasserman applied for (and subsequently received) permission to demolish 176, 178, and 180 Beacon, and they were razed soon thereafter. On June 23, 1964, Leonard Properties transferred the property to the 180 Corporation, also an affiliate of Wasserman Development. On August 10, 1965, the project filed to add a penthouse, and in October of 1965, the Board of Appeal approved a variance allowing the additional floor. As approved, the building had 132 apartments: 130 units on floors 2 through 17, the penthouse, and a superintendent’s unit. In a December 12, 1965, Boston Globe article by Anthony J. Yudis noted that “when one thinks of new construction in areas considered hallowed ground by urban experts, he must also have uppermost in his mind such concerns for compatibility with surrounding environment and preservation of architecturally-historic structures. 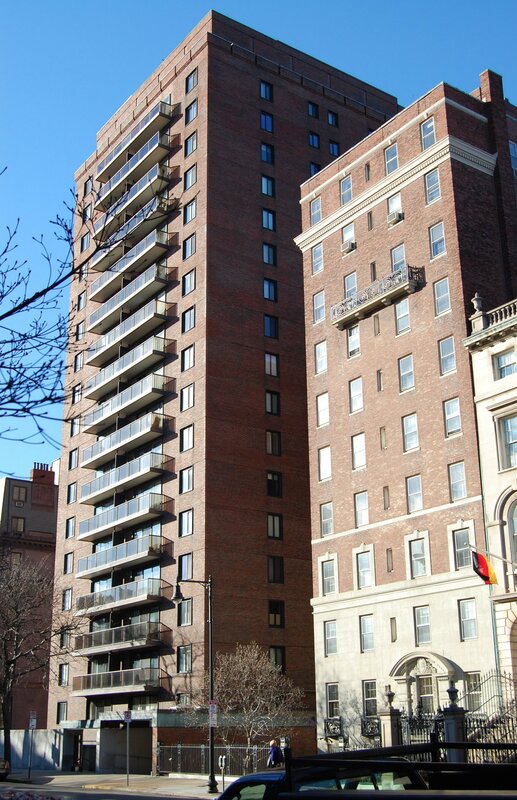 On December 30, 1969, 180 Corporation transferred the property into Max Wasserman’s name, and on November 15, 1971, he converted the property into 114 condominium units (112 residential apartments, one residential penthouse unit, and one commercial unit), the 180 Beacon Condominium. 176 Beacon was built ca. 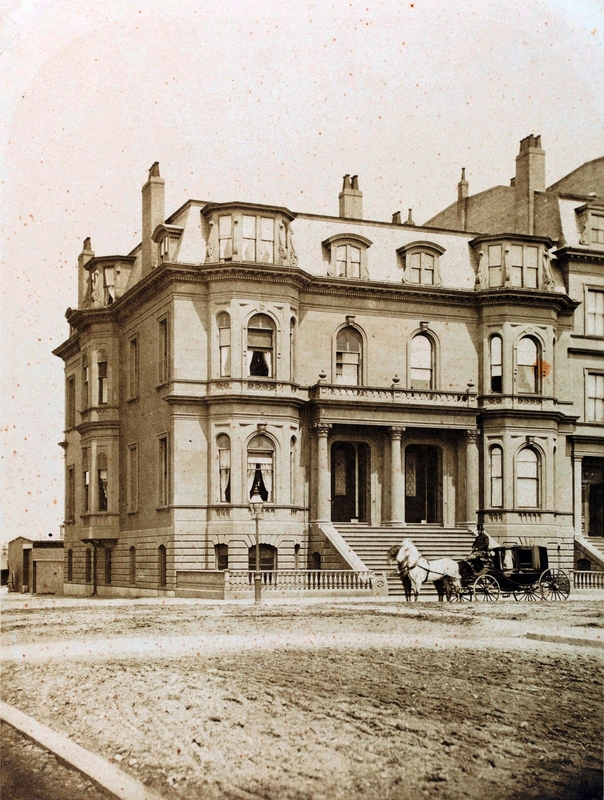 1861, one of two contiguous houses (174-176 Beacon) built for Robert Caldwell Mackay and his wife, Charlotte Langdon (Lodge) Mackay. They were originally numbered 138 Beacon and 139 Beacon, but re-numbered as 174 Beacon and 176 Beacon ca. 1862 when homes were built on the south side of the street. Click here for an index to the deeds for 176 Beacon (Demolished). George Mackay married in October of 1874 to Maria Starbuck. After their marriage, they lived at 176 Beacon with his parents. They all continued to live at 176 Beacon until about 1880. 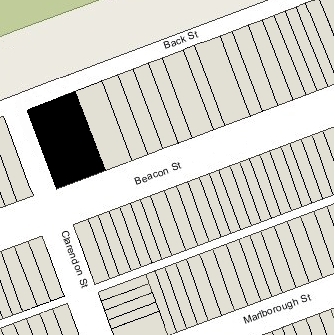 By the 1880-1881 winter season, Robert and Charlotte Mackay had moved to 220 Commonwealth, and George and Maria Mackay had moved to 218 Commonwealth. On May 31, 1881, 176 Beacon was purchased from Robert Mackay by John Chipman Gray, an attorney and professor at Harvard Law School. He and his wife, Anna Sophia Lyman (Mason) Gray, made it their home. They previously had lived at 83 Marlborough. In April of 1908, John Chipman Gray’s sister, Harriet Gray, purchased 178 Beacon and made it her home. John Chipman Gray died in February of 1915. Anna Gray continued to live at 176 Beacon. In about 1917, she was joined by her son and daughter-in-law, Roland Gray and Mary (Tudor) Gray. He was an attorney in the firm founded by his father. They had lived at 33 Brimmer in 1916. Roland and Mary Gray also maintained a residence in Southern California. Anna Gray died in May of 1932. By 1933, Roland and Mary Gray were living in Cambridge. On May 28, 1935, the estate of John Chipman Gray transferred 176 Beacon to Roland Gray and his sister, Eleanor (Gray) Tudor, the wife of Henry Dubois Tudor, and they, in turn, sold it to Philip Fowler, a salesman, who lived at 31 Winchester. He married in September of 1937 to Opal Frances Crane, after which they lived at 176 Marlborough. Philip Fowler converted 176 Beacon into a multiple dwelling, either a lodging house or apartments. In about 1952, Philip and Opal Fowler divorced, and on June 19, 1952, Philip Fowler transferred 176 Beacon to Edward R. Hale, an attorney, who then transferred the property to Opal Fowler on August 8, 1952. On January 16, 1960, 176 Beacon was purchased from Opal Fowler by real estate developer Fred Podren. He had acquired 178-180 Beacon in December of 1959, and proposed razing all three houses to construct a new apartment building. The properties were subsequently acquired in March of 1964 by developer Max Wasserman, and on May 6, 1964, he filed for (and subsequently received) permission to demolish the buildings. 178 Beacon was built ca. 1862 for Benjamin Tyler Reed, one of a pair of symmetrical buildings. He and his wife, Mary Sanderson (Coolidge) Reed, lived at 180 Beacon and his son and daughter-in-law, John Hooper Reed and Sarah Byers (Post) Reed, lived at 178 Beacon. Benjamin Reed purchased the land for 178-180 Beacon on June 7, 1860, from the Boston and Roxbury Mill Corporation. He owned both houses after they were built. Click here for an index to the deeds for 178 Beacon (Demolished). Benjamin Reed was a shipping merchant trading largely in Russia and an investor in railroads and various manufacturing firms. John Hooper Reed was treasurer of the Bay State Iron Company, in which his father was a major investor. John and Sarah Reed previously had lived at 5 Louisburg Square. Benjamin Reed died in March of 1874. In his will, he left 178 Beacon in trust for the benefit of John and Sarah Reed, and 180 Beacon in trust for the use of his wife for the remainder of her life, and, after her decease, to the Episcopal Theological School (which he had helped to found). Sarah Reed died in February of 1877. John Reed continued to live at 178 Beacon until about 1879, when he moved to Cotuit (he married again, in February of 1880, to Martha Smith; after their marriage, they lived in Barnstable). By 1880, 178 Beacon was the home of attorney William Goodwin Russell and his wife, Mary Ellen (Hedge) Russell. They previously had lived at 18 West Cedar. They also maintained a home in Plymouth. Mary Ellen Russell died in September of 1886. William Russell continued to live at 178 Beacon until his death in February of 1896. The Russells’ daughter, Marion, continued to live at 178 Beacon and, in October of 1897, she married stockbroker William Smith Townsend. They lived at 178 Beacon until about 1902, when they moved to 255 Marlborough. 178 Beacon was not listed in the 1903 Boston Blue Book. By the 1903-1904 winter season, 178 Beacon was the home of Dr. John Bapst Blake and his wife, Anne (Hastings) Blake. They previously had lived at 302 Beacon. John Bapst Blake was a physician and surgeon. He also maintained his offices at 178 Beacon (prior to moving there, he had maintained his office at 212 Beacon with his father, John George Blake, and his brother, Gerald Blake). He would later become surgeon-in-chief at Boston City Hospital and a professor of surgery at Harvard Medical School. Eben Jordan apparently changed his plans, however, and continued to lease both houses to others. 178 Beacon remained the Blakes’ home until late 1908, when they moved to 161 Beacon. On February 13, 1908, Eben Jordan transferred 178 Beacon and 180 Beacon to his son, Robert Jordan. On February 13, 1908, 178 Beacon was acquired from Robert Jordan by Miss Harriet Gray. She previously had lived at the Hotel Hamilton at 260 Clarendon and, before that, at 143 Beacon with her father and step-mother, Horace Gray and Sarah Russell (Gardner) Gray. Harriet Gray’s brother and sister-in-law, John Chipman Gray and Anna Sophia Lyman (Mason) Gray, lived at 176 Beacon. Harriet Gray continued to live at 178 Beacon until her death in March of 1923. On June 15, 1924, 178 Beacon was purchased from Harriet Gray’s estate by Joseph E. Doherty and his wife, Mary (Flynn) Doherty. They previously had lived at 114 Bay State Road. Joseph Doherty was a ship and yacht broker, and formerly had been a wholesale liquor dealer. They continued to live at 178 Beacon until his death in May of 1945. On January 10, 1946, 178 Beacon was acquired from Mary Doherty by the Belmont Realty Corporation. It leased the property to the French Consulate. The property changed hands, remaining the French Consulate until about 1960. By 1961, it had moved to 3 Commonwealth. On December 28, 1959, 178 Beacon was acquired by real estate developer Fred Podren. He acquired 180 Beacon on the same day, and 176 Beacon in January of 1960. He proposed razing all three houses to construct a new apartment building. The properties were subsequently acquired in March of 1964 by developer Max Wasserman, and on May 6, 1964, he filed for (and subsequently received) permission to demolish the buildings. 180 Beacon was built ca. 1862 for Benjamin Tyler Reed, one of a pair of symmetrical buildings. He and his wife, Mary Sanderson (Coolidge) Reed, lived at 180 Beacon and his son and daughter-in-law, John Hooper Reed and Sarah Byers (Post) Reed, lived at 178 Beacon. Click here for an index to the deeds for 180 Beacon (Demolished). Benjamin Reed and Mary Coolidge had married in June of 1861 and 180 Beacon probably was their first home together. His first wife, Elizabeth Trevett (Hooper) Reed, had died in October of 1859; they had lived at 11 Tremont Place. By the 1892-1893 winter season, Mary Reed had been joined at 180 Beacon by her sister, Grace Sanderson Coolidge. She continued to live with Mary Reed until her death in March of 1900. Mary Reed died in March of 1904. On April 14, 1904, pursuant to Benjamin Reed’s will, his estate transferred 180 Beacon to the Episcopal Theological School. Architect Arthur Little is listed as a resident of 180 Beacon in the 1906 City Directory, and it appears that he may have been retained by Eben Jordan to remodel the houses. 180 Beacon was not listed in the 1905 and 1906 Blue Books. In 1907 and 1908, 180 Beacon was the site of the De Merritte School, operated by Edwin DeMerritte. It had moved to 815 Boylston by 1909. On April 27, 1908, 180 Beacon was purchased from Robert Jordan by Helen Southworth (Shaw) Endicott, the wife of investment banker William Endicott, III (called William Endicott, Jr.). They previously had lived at 165 Beacon. Helen Endicott died in September of 1910 and William Endicott moved soon thereafter to 32 Beacon. On September 4, 1911, 180 Beacon was acquired from William Endicott, Jr., by Eben Sumner Draper. He was a manufacturer of cotton machinery in the firm founded by his father in Hopedale, and had served as Governor of Massachusetts in 1909 and 1910. He and his wife, Nannie (Bristow) Draper lived at 150 Beacon. On November 3, 1911, Eben Draper transferred 180 Beacon to his daughter, Dorothy. Later that month, she married banker Thomas Brattle Gannett, Jr., and it became their home. They continued to live there until 1914, when they moved to 150 Beacon after the death of her parents (her mother died in September of 1913 and her father died in April of 1914). 180 Beacon was not listed in the 1915 Blue Book. On June 18, 1915, 180 Beacon was purchased from Dorothy Draper by Annie Lee (Allen) Chauvenet, widow of St. Louis attorney Louis Chauvenet. She previously had lived at 25 Commonwealth. She continued to live at 180 Beacon during the 1916-1917 winter season, but moved thereafter to 13 Commonwealth. On April 30, 1917, 180 Beacon was acquired from Annie Chauvenet by the estate of Percival Lowell, who had died in November of 1916, and became the home of his widow, Constance Savage (Keith) Lowell. Percival Lowell was a noted astronomer and Orientologist. He founded the Lowell Observatory in Flagstaff, Arizona, where he conducted extensive research on Mars and other planets. Constance Lowell also maintained homes in York, Maine, and Newport. In August of 1945, Percival Lowell’s estate transferred 180 Beacon to Constance Lowell. On December 13, 1949, 180 Beacon was purchased from MIT by Margaret (Thomas) Gardiner, the wife of William Tudor Gardiner. They previously had lived at 184 Beacon. William Gardiner was an attorney and had served as Governor of Maine from 1928 through 1932. William Gardiner died in August of 1953. Margaret Gardiner continued to live at 180 Beacon until about 1959. On December 28, 1959, 180 Beacon was acquired by real estate developer Fred Podren. He acquired 178 Beacon on the same day, and 176 Beacon in January of 1960. He proposed razing all three houses to construct a new apartment building. The properties were subsequently acquired in March of 1964 by developer Max Wasserman, and on May 6, 1964, he filed for (and subsequently received) permission to demolish the buildings.